Once upon a time two weeks ago, I bought a super cheap and clunky and old washing machine with load settings of Small, Large, Extra Large, and Super (because this is America) and after about a dozen YouTube videos and even more appliance repair forums, I diagnosed it as needing a new lid switch and a sagging apron repair. Why don't we just buy new appliances like normal people? Ugh, I don't know. Actually I do. It all has to do with an adjective that starts with an S and ends with a TINGY and describes one 5'7'' homemaker with an oft forgotten blog. Jacob puts up with it because he finds it rather humorous. So the other day, with the resolve only a mother can have when both her children are sleeping peacefully at the same time, I waltzed into the garage to service the beast with the new lid switch that had come in the mail the day before. I got as far as taking the front panel off before I realized that for all my good intentions, sleeping babes, and newfound washer knowhow, there was just no way a wrench, a measuring stick, and a saw - the only tools not on the job with the husband - were gonna make this job happen. Soon enough I was back at the computer. Jacob's merciless schedule open on one tab. 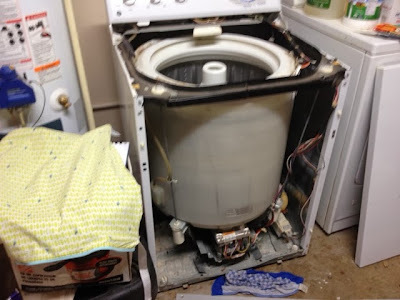 Washing machine repair video on another. Pinterest on another. And you, Blogger, making me feel guilty for all my postless days, on another. And while no post happened that day, today is Groundhog Day which I guess makes it my blogoversary. Happy anniversary, little blog. In your honor, I will ramble a post away as usual, saying the same old things while taking furtive glances at the dishes in my sink and trying to ignore the twitching that always comes when my kitchen is dirty and the little voice whispering in my head on a merciless repeat: "The roaches are coming..."
We've been having ourselves some LONG days in our new little house. Jacob is working every day, and it's rare for him to be home before 7:30. We're looking at another month before things slow down. Sunday mornings are the brightest of the week because he doesn't start jobs until noon. The house is coming together in little bursts. We finally got our bookshelves up. We mounted the TV. We hung some pictures. We still need some furniture for our bedroom - one being a chest of drawers so I have a place to put clothes, but we won't be making that happen probably until March, since I can hardly buy groceries by myself much less furniture. Right now all my clothes are in several heaps on the shelves in Jake's closet and I'm thinking about just tossing the whole lot. My wardrobe and I aren't on good terms. Nor will we be any time soon. I don't know how to shop for this postpartum body. I don't like shopping online because I won't know how things will fit, and I experience enough stress shopping alone that I don't dare adding two littles and a leaky bra area to the mix. I'm sorry. I don't know why I'm talking about this. Stopping stopping stopping. The other night I was making dinner that involved a very hot pan on the stove, a very hot oven, and the willing if hazardous helper that is the two year old. I had stupidly decided to make bread earlier in the afternoon (I'm such a bad bread baker but I just can't quit you) because I thought it would be an enriching activity for Jake, when it ended up just being stressful, and my artisan loaf just flattened and flattened. Long story short, I overreached. And before I knew it, the house was a war zone, dinner wasn't ready, and the napless stuffy-nosed boy was throwing a fit on the floor. So I whipped up a blueberry/spinach smoothie with some hemp and flax seeds (some standards die hard apparently) and set him up in the high chair with it and some canned salmon slathered with ketchup - all one handed because my generally sweet Lucy June was crying crying crying. Still trying to juggle the craziness, I was kicking swaddling blankets to a corner and shuffling soiled dishes into the dishwasher and tending to my stir fry. Then the toddler inhaled a seed or something and started hacking and hacking and couldn't stop and the baby was crying crying and dinner was burning and I was tripping over a jumbled mess of toy cars and screws and blocks. My phone started buzzing on the counter. Jacob. He was on his way but was starving and thinking about just stopping and eating something. (And, man, if I could've scratched his eyeballs out through the phone...#notmybestself) I could hardly string a sentence together, but through my growling he deduced he should perhaps just hurry home. So I grabbed the hacking boy some water and then I picked up a rag to sop up a runny mess somewhere and a ROACH. ran up. my arm. Not kidding. Give me spiders. Give me scorpions. Give me stinging insects galore. But, no, I live in muggyville with the roaches. And on this particular night one of those roaches was running up my arm. In that moment, I decided, I had arrived. If you are currently in that moment, oh kindred young mother reader, let me extend: May the quiet low light of evening and glass of wine soon be yours. May your chocolate squares be copious and rich with the seasoning only sleeping babes can bring. Anyhow. To round out a good ramble: my husband and my brother eventually fixed the washing machine to the tune of me saying "But the YouTube guy said..." while bouncing a three month old and distracting a two year old and feeling generally helpless...and grateful. Grateful for the goodness of these days. Grateful for days spent watching the sweetest wide-eyed baby in the world and gearing a toddler toward good things and making dinner for two hardworking men. And still somehow grateful for those other days when Lucy June won't stop fussing and Jake watches Dolphin Tale on repeat (en espanol...helps with the mommy guilt) and end with nuggets dipped alternately in honey mustard and ranch at Chick-fil-a. It can be so hard parenting little people. So hard. Gosh it makes me crazy, but gosh it if ain't marvelous too. I can't believe the goodness. I can't believe the goodness all around me. Is it kosher to have wine at a 10 am play date? Because I'm thinking yes, yes it it. You have a mounted TV in your place?? Who ARE you? Love it. Solidarity sista soulja!! Here's to celebrating the good days!! Oh, these are the most glorious blonde, cherubic babies. You make me laugh. Loved it all. I really wish you were my neighbor so I could give you my kids to watch too. Haha. Kate. You are so funny! And I respect you big time for trying to fix the washing machine all by yourself!! I would have totally lost it with the roach!! And isn't youtube amazing? I figured out how to re-rush our dining room chairs that way. Cute pics of the kids! A few years ago we moved when my 3rd was two weeks old. And it was a dump of a house, a fixer that needed a LOT of work. Fast forward 4 years and we've made a lot of improvements and it feels like a normal house. Now it's my FIFTH that's just a few weeks old, and last night I was taken back in time to that insanity when we moved with a newborn, and I SO remember staring at all the boxes and being unable to do anything about it. And I thanked God that we are in such a better place now. Even with 5, life is good and smooth, and the olders help out or go run outside to play, and it's not nearly as frenetic as life can be with a couple of really young kiddos. Anyway, you are amazing to still find gratitude and joy in your life...keep fighting the good fight. I love your blog and am happy to have found it! - Lauren (by the way, I want to sign in with a name, but when I hit "google account", it just gives me "unknown" for a name...I don't know how to fix this!! Anyone have any ideas? aaaa-MEN to this whole post. Except the roach, to which I say: OH my gosh. And oh MY gosh again. I can't even. At least you have stunningly beautiful children, and at least you can weave a fantastic post from your misfortunes. Both of these things are for the good of mankind. I hear ya! Thems are long days, and wine is a given methinks. Thanks for writing this; I had one of those days when I slammed a lot of cupboards because the baby wouldn't stop crying and felt like a terrible, terrible mom. Honestly, some days call for hard liquor...sometimes you just can't mess around. I'm super impressed that you even attempted a washer fix...I don't even know where Ryan keeps his tools. Do we have tools? I need to check. Oh woman. SAHM-high-five for perfectly capturing the essence of "that moment" which we all have had, though, truth be told, the fact that your "moment" involved a roach ON YOUR PERSON makes you more legit than I'll ever be. Please tell me you killed it with a kabocha squash or something equally earthy and delicious that I'd expect to find in your kitchen. This post is lovely for so many reasons. I'm sorry Jacob is gone for so long every day, and I think I say it every time I comment but I just wish you still lived in CA ;) Selfishly, of course. The last paragraph of this post I've read over and over again...so beautiful, and your writing is truly the best. And this quote will be on my fridge soon...I just need to write it out: "May the quiet low light of evening and glass of wine soon be yours. May your chocolate squares be copious and rich with the seasoning only sleeping babes can bring." I thought trying to change a door handle this week was clever, but a washing machine! you're in a whole new realm Kate. Motherhood is glorious, bloody hard and most of the time a blur….but did i say glorious too! I think this is a wonderful story! You positively know the best way to convey an issue to mild and make it important. Extra individuals have to read this and perceive…Leather Repair Houston leaders in leather repair in Houston. If it needs restored, Trust leatherman leather repair. I exposed your blog the use of msn. This is a actually well written article. I'll be sure to bookmark it and return to read extra of your cooperative information. Thank you for the post. I'll certainly comeback.